It is important to have rodent control performed quickly when your home in Oceanside, California, is infested. 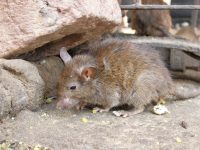 Rats, mice, and other rodents can cause extensive damage to a home by chewing through insulation, wiring, and other areas, all while causing unsanitary conditions through urine and droppings. What’s more, rodents breed rapidly, so what may seem like a minor problem can quickly get out of control. Comprehensive – Our experienced technicians perform thorough inspections, sealing entry points and identifying infestation sites before developing a solution. Customized – Our rodent control services are tailored to each customer’s circumstances to ensure the best possible results. Effective – The RO-DEX system we use has been proven to eliminate infestations and prevent them from recurring – a claim we back with a two-year warranty. If you’d like to learn more about the rodent control services we offer to homeowners in Oceanside, CA, contact Kilter Termite and Pest Control today. Also, ask about how we can restore sanitary conditions to your home by replacing your old insulation with TAP Pest Control Insulation, which can provide an extra barrier against future pest infestations.